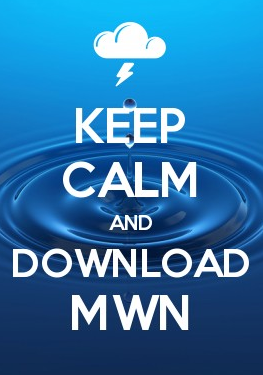 MWN Blog: Christmas weekend weather outlook - no sleigh for Santa! 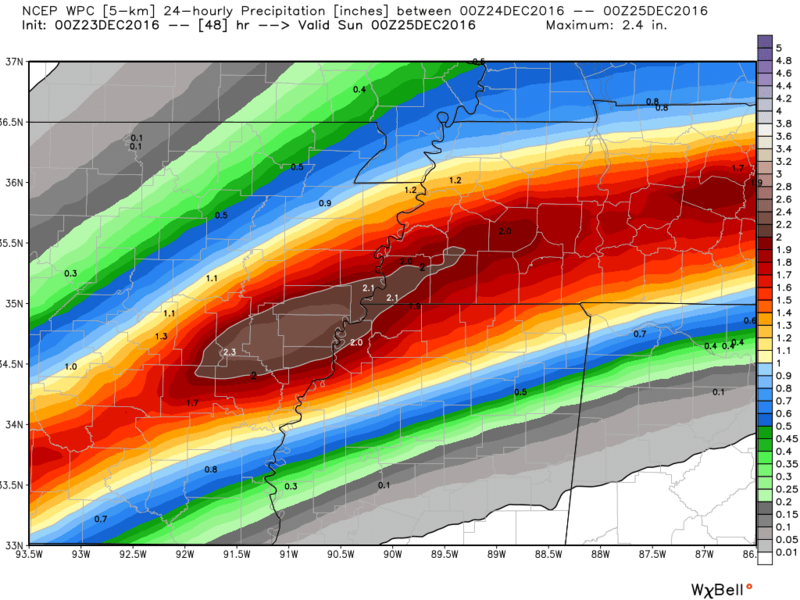 Christmas weekend weather outlook - no sleigh for Santa! We've already had three Arctic waves affect the Mid-South, but we finally officially started winter on Wednesday - just in time for it to warm back up! Today's weather was comfortable for late December with highs in the lower 50s. 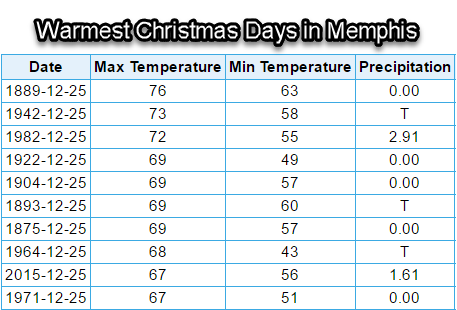 After falling to the mid 30s tonight, we'll start another multi-day temperature climb as the mercury heads towards a peak on Christmas Day that will go into the record books as one of the warmest Christmases on record. Before then, we will get the first of what will be probably three distinct rounds of precipitation over the coming week. This first one could produce the highest totals of the three. Southerly flow gets re-established tomorrow, pushing temperatures well into the 50s and setting the stage for a cool front of Pacific origin (as opposed to the Arctic fronts of late) to move into the Mid-South. It will be accompanied by upper-level energy that will enhance precipitation along the front, particularly Friday night into Saturday morning. While Friday will be mainly dry, by the evening rush hour, light rain will likely be falling and then increase in intensity overnight before tapering off Saturday mid-day. Rainfall totals through this period could be around 2" with most falling between midnight and noon Saturday. After reaching the mid to upper 50s Friday afternoon, temperatures won't fall overnight, remaining in the upper half of the 50s, then climbing Saturday afternoon once rain tapers off into the mid 60s. Friday evening could also be breezy as the front approaches and south wind increases ahead of it. On Saturday night, the front that stalls just to our south returns north as a warm front, bringing an additional chance of a few showers. If you're planning to attend Christmas Eve services Saturday night, there could be a few showers around but it will be mild with temperatures remaining above 60 degrees. By Christmas morning, the rain should be mostly to the north closer to the retreating warm front and it will be very mild. Temperatures remain in the in the upper 50s to lower 60s all night Saturday night - no sleigh for Santa in this part of the country! 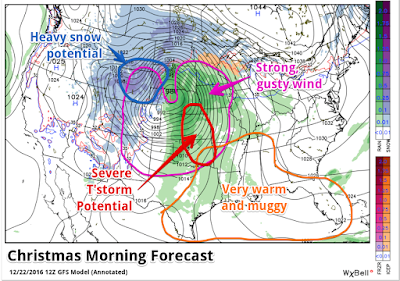 Christmas Day will see a large-scale developing storm system in the middle of the country. 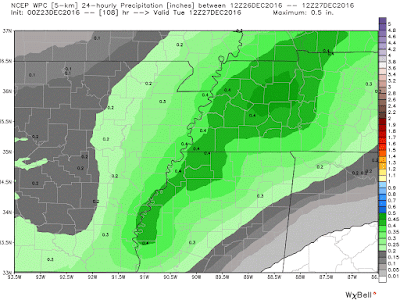 The Mid-South will be positioned in the warm sector of the storm with southerly flow and likely very low rain chances. With a few breaks in the clouds, temperatures should reach 70 degrees without too much trouble. A little more sun and we could move up the list of top 5 warmest Christmases on record, to go with some humid air from the Gulf of Mexico! To our west, severe thunderstorms will be a hazard from eastern TX into OK and eastern KS. 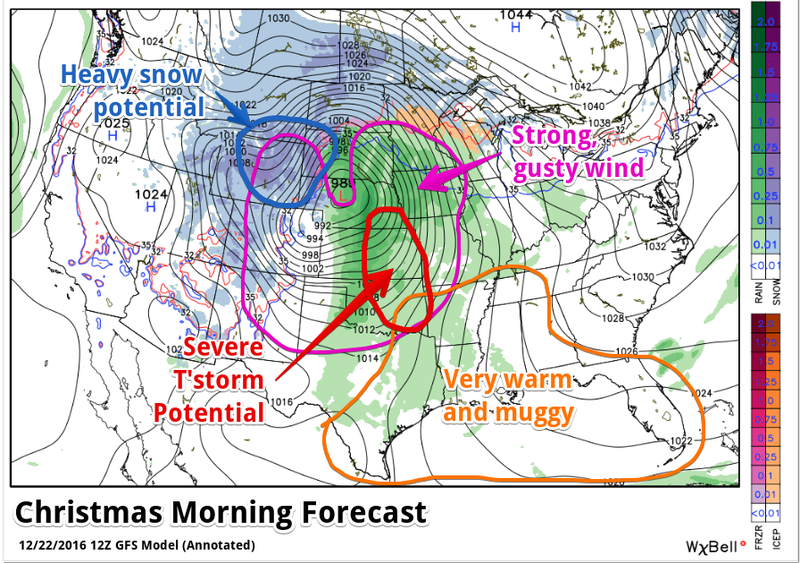 Meanwhile heavy snow will be likely on the backside of the system over the northern Plains. Fortunately, it doesn't appear that the severe weather will make it to the Mid-South, but the front will move through the area on Monday, bringing another round of rain and perhaps a few thunderstorms. This event won't be bring heavy rain like Friday night's system, as the upper level energy should go by well to our north. In fact, the front will again "wash out" over or just south of the area heading into Monday night. Looking further out, Tuesday could see a chance of a few showers, but should be an "in-between" day before yet another system affects the region as low pressure forms on the stalled front to our west and moves through the region with yet another round of rain Wednesday or maybe Thursday. 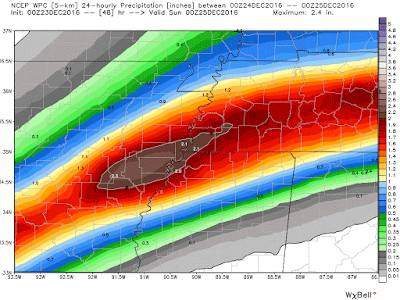 Details remain sketchy on exact timing of this system at this point. 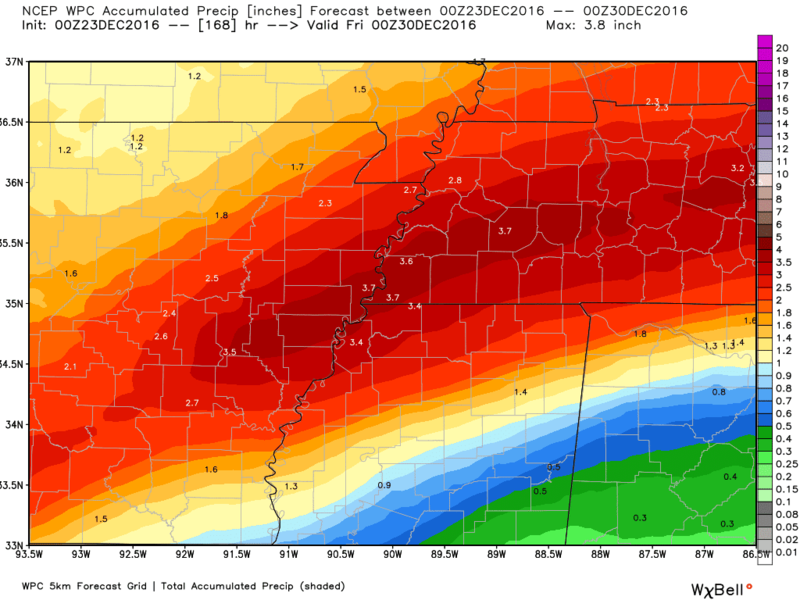 That would make it three rainmakers though in the next week with a potential for an additional 3-5" of rain over the next week, before we reach the end of the year!